When proportional control is used in a system, the final control element may be in any position within its operating range. For example , a valve may be 75% open, not just 0% or 100% as with two-position control. The word “proportional” refers to the fact that there is a continuous relationship between the value of the controlled variable, the deviation and the position of the final control element. This means that as the measured variable moves away from the set point, the final control element gets adjusted proportionately by the controller to bring the measured variable back to the set point. Proportional control can be used to provide a greater degree of control action than two-position control. With the proper control setting, proportional control can be used to maintain a balance between the input and output of a system. The proportional band is the amount of input change (range of the measured variable) needed to provide a full range of output change (range of positions of the final control element) caused by the controller. For example, if a steam heating process can vary from 100 oC to 200 oC, the amount of input change is 100oC (or the range of the measured variable which 200 oC – 100 oC = 100 oC ). The full range of the output change is a fully closed to a fully opened valve. The controller causes the value to open or close according to the amount of deviation from the temperature set point of 150 oC. The amount of change that the controller causes is called proportional control action. Widening the proportional band width means that it will take more of an input change (more of a deviation from the set point) to give a full range of output (fully opened to fully closed). Or think of it this way : the measured variable has to deviate a large amount from the set point to produce a small change in the final control element. 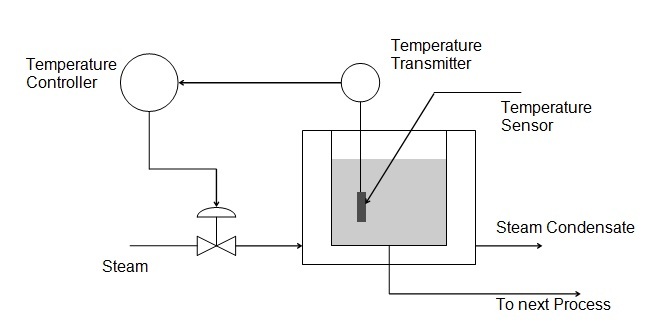 The amount of proportional control action that is used in a process loop will depend upon the process being monitored. Each process has its own characteristics and variables. Therefore, each process will have a specific proportional band within which the process will operate smoothly and efficiently. With a very narrow proportional band, it takes very little change in input (deviation from the set point) to move the valve through its full range. The valve is very sensitive to error signals from the controller. The characteristics of a narrow proportional band are similar to those of two-position control. As with two-position control, a narrow proportional band can cause oscillations in the controlled variable. These oscillations in many cases will gate progressively worse, leading to more instability. For many processes, oscillations must be avoided. Therefore, a narrow proportional band would provide too much proportional control action for these processes. With a very wide proportional band, the full range of input change moves the valve only slightly. In effect, this would be similar to opening the valve halfway and leaving it in that position. The temperature is corrected very slowly over a long period of time. It is important to remember that each process has an appropriate proportional band setting. The acceptable values of one process may not be acceptable values for another process. Some processes may require a narrow proportional band or a wide proportional band. Others may require a proportional band somewhere between the two. Systems using proportional band control action often exhibit a condition referred to as Offset. After the oscillations have settled out in a process, there may be a difference between the actual value of the controlled variable and the set point. Offset is defined as a constant and steady deviation from the set point. Offset is a major disadvantage of proportional control. The result is steady and consistent, but not exactly on target. Offset occurs when there is a change in the manipulated variable that cannot be detected by the controller. For example, due to wear and tear, the measurement of the speed of a pump supplying liquid to a blender is off by 5 rpms. The controller has no way of detecting or adjusting for this deviation. The set point remains the same; however, actual supply of liquid is off slightly. what are pressure relief valves?